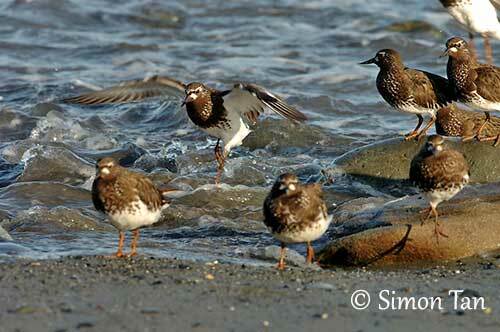 The Black Turnstone is strictly coastal and usually found in rocky sites along coasts. It breeds in Alaska and winters along the Pacific coasts of North America. Its cryptic plumage makes the bird hard to see when it moves on rocks while searching for food. 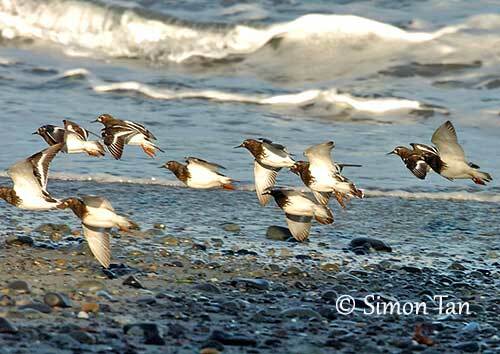 It is a close relative of the Ruddy Turnstone, with similar size and flight pattern. However, its plumage lacks the warm chestnut areas, and it is slightly more heavily built. 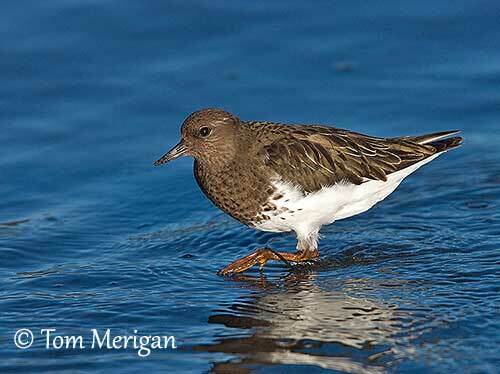 The Black Turnstone is not globally threatened, but conservation action will be needed in the future. The Black Turnstone in breeding plumage is black and white. The upperparts are black, including the head. However, we can see a white eyebrow and a white spot at bill base. Crown, sides of neck and breast, and greater coverts are finely spotted white. There is a central white patch on the back, well visible in flight. Rump and uppertail-coverts are white. The tail is black with broad white base and narrow terminal white band. On the underparts, chin, throat and breast are black, with descending rows of small black spots from lower breast and flanks to the white upper belly. Undertail-coverts and underwing are mainly white too. The bill is blackish. The eyes are dark brown. Legs and feet are brownish-black with pinkish or reddish tinge. The female resembles male but she is slightly larger. She has smaller white patch at bill base. The non-breeding adult lacks the white spotting on head, nape and breast sides. Upperparts and breast may appear darker. There is a short, pale line at rear of the eye. Scapulars, tertials and coverts have white edges. The dark spotting on flanks and lower breast is reduced or absent. The juvenile resembles non-breeding adult but the black areas have brownish tinge. Scapulars, tertials and coverts have buffy-white edges and fringes. The breast band is paler, mostly brownish-grey. The bill may have pale base. The Black Turnstone breeds in W and S Alaska, and winters along the Pacific coast of North America, from SE Alaska to NW Mexico (S Baja California and S Sonora). The Black Turnstone is strictly coastal. It frequents rocky shores, breakwaters, islets, isolated outcrops and reefs on offshore islands outside breeding season. It can be seen on adjacent sandy beaches and mudflats. During the breeding season, it nests in sparsely vegetated coastal plains, usually near coastal meadows. 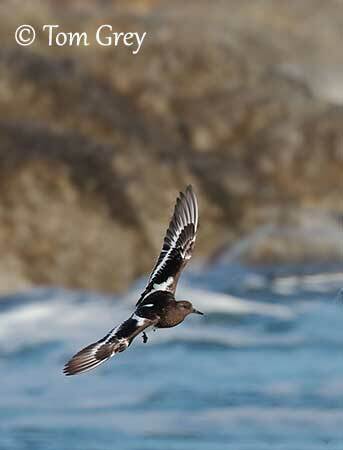 The Black Turnstone gives a trilling “skirrr” in flight, higher-pitched than the calls of Ruddy Turnstone. It also utters a guttural rattle and repeated, nasal “weepa weepa weepa” in alarm. 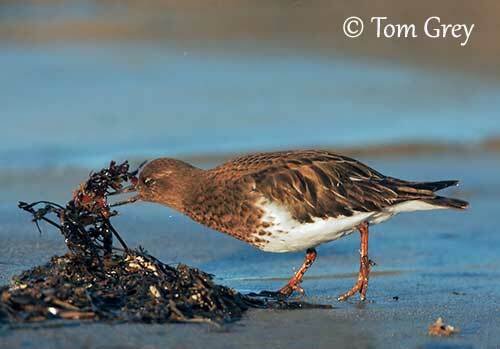 The Black Turnstone feeds on insects during the breeding season, and also takes seeds and berries. But outside breeding period, it feeds along the coasts on marine invertebrates such as barnacles and molluscs, limpets and other crustaceans and marine worms. It forages by walking and clambering slowly in search of food. It inserts its bill in the opening of a shell to open it, or breaks it by hammering. Molluscs and limpets are taken from rocks with the pointed bill. It also searches under rocks or seaweed, and turns over stones and vegetation to find hidden prey. The Black Turnstone usually returns to the same nest-site every year, and both mates breed again together. They reform the pair-bond immediately, as soon as they arrive on their breeding grounds. The male performs spectacular aerial displays over the territory, with dashing zigzag chases. It also makes a flight during which it raises high in the air before to dive down like a snipe. We can hear an audible noise produced by feather vibrations. They nest on the ground among the vegetation, and usually close to water. They become very aggressive towards predators such as gulls and jaegers. The Black Turnstone is migratory. It follows the coastline during the spring migration, but some non-breeders may remain in S all year round. During the autumn migration, some birds may sometimes cross the Gulf of Alaska by flying across the water rather than following the coast. 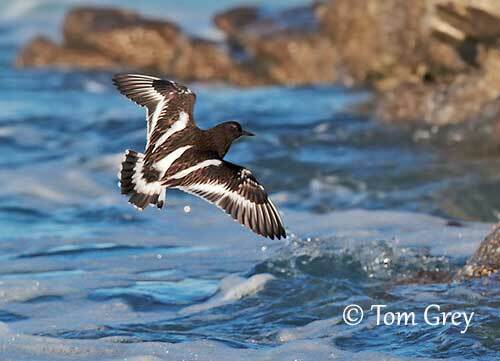 The Black Turnstone has powerful, direct flight, often low, with shallow, rapid wingbeats. The laying occurs between mid-May and late June. The Black Turnstone is solitary nester or semi-colonial. The nest is built by both adults on the ground, among grass and sedges, hidden (or not) by tall vegetation. It is a shallow depression usually lined with grasses. The female lays 3-4 yellowish-green eggs with dark markings. Both adults incubate during 22-24 days, the male mostly at night. The downy chicks leave the nest very soon after hatching. They are tended by their parents, but the female often leaves two weeks later and the male care for them. But the young are able to feed themselves. They make short flights at 23 days, and fly well when they are 28-30 days old. 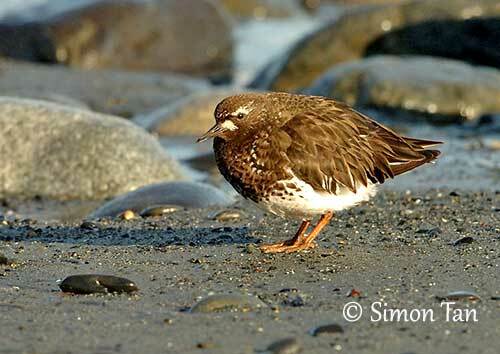 The Black Turnstone is not globally threatened. The breeding population was estimated at 76,000/114,000 individuals in 1991. 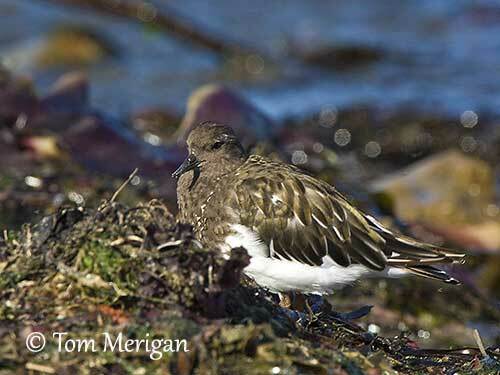 The trend is currently stable and the Black Turnstone is evaluated as Least Concern.